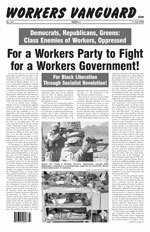 We reprint the following article from Spartacist Canada (No. 156, Spring 2008). On December 10 last year, Aqsa Parvez, a 16-year-old girl of Pakistani descent in the Toronto suburb of Mississauga, was strangled by her father after she refused to wear the Islamic hijab (headscarf). She died in hospital the next day. Aqsa’s father has now been charged with murder, while her older brother is charged with obstructing police. The killing of Aqsa Parvez follows a series of murders of Sikh women in B.C. [British Columbia] by their husbands and other relatives. In October 2006, the charred remains of schoolteacher Manjit Panghali were found in Surrey. Her husband and brother-in-law were charged in her murder. Around the same time, Gurjeet Kaur Ghuman, a nurse, was shot in the face, blinded by her husband before he killed himself. Yet another woman, Navreet Kaur Waraich, was stabbed to death—her husband is charged with her murder. South Asian women in the B.C. Lower Mainland organized protests against these murders and attempted murders in the fall of 2006 and again last spring. Violence against women crosses class and ethnic lines with brutal indifference. But the killings of Aqsa Parvez and the Sikh women in B.C. are something different. Like the murders of Turkish and Kurdish women by male relatives in Germany, Britain, Sweden and other imperialist countries in recent years—and countless more such killings in the Near East, Central and South Asia—these were essentially “honour” killings. These brutal killings grow out of the clash between a woman’s desire for independence from “traditional” culture and the legacy of pre-capitalist social and economic norms that persist in large swathes of the world. “Honour” killings reflect the treatment of women as the property of fathers or husbands. Like most teenage girls, Aqsa Parvez wanted to make her own decisions about how to dress, what friends to have, what her future should be. But for her father this was an affront to his control of his daughter as prescribed by Islam. A pattern among the Sikh women victims in B.C. was their relative economic independence, with jobs as teachers, nurses, software engineers, etc. Such independence clashes with traditional Sikh society, where arranged marriages and dowry are the norm. There has also been a rise in selective abortion of girl fetuses among South Asians in the Vancouver area. In January, a Sikh man in suburban Delta, reportedly distraught at having three daughters but no sons, was charged with murdering his youngest daughter, two-year-old Rajvinder Kahlon. These killings highlight the explosive mixture of women’s oppression and anti-immigrant racism in Canada today. Sections of the bourgeois media have sought to exploit them to whip up anti-immigrant bigotry. After the Aqsa Parvez killing, right-wing Toronto Sun columnist Peter Worthington headlined his 14 December 2007 column, “Girl’s Death Puts Islam in Hot Seat.” A conservative blogger called to boycott taxis driven by Muslims (Aqsa’s father is a cab driver). Others railed against multiculturalism and called for state bans or restrictions on Islamic dress. We denounce all attempts to exploit these horrible crimes to fuel reaction against immigrants and ethnic minorities. We call for full citizenship rights for all immigrants, denounce the scapegoating of Muslims under the bourgeoisie’s “war on terror,” and defend the rights of ethnic minorities to practice their religions. In particular, we oppose state bans on the veil or other religious dress and emblems. This would only serve to further isolate Muslim women in the home, reinforcing social backwardness, including the hold of religion and family, and deepening their oppression. At the same time, we solidarize with the many women who have sought to throw off the cruel strictures of religious traditionalism—including the veil, symbol and instrument of the subordination of women under Islam. The racist attacks on Muslims and Sikhs in Canada today in no way mitigate appalling crimes like “honour” killings. going with some other boy or some other thing” (National Post, 14 December 2007). Two women who had taken Aqsa into their home on various occasions interrupted to protest these outrageous remarks, then walked out of the press conference. The subjugation of women in underdeveloped countries like Pakistan and India, as well as in immigrant communities within Canada, is not rooted in some uniquely reactionary quality of Islam or Sikhism, as some right-wing ideologues claim. The institution of the family—the main vehicle for the transfer of private property and the regimentation of society—is the main source for the oppression of women. This holds true in the imperialist and neocolonial worlds alike. Christianity too has a long, grisly history of anti-woman brutality, which continues to this day: witness the barbaric “family values” crusades of Christian fundamentalists against abortion, birth control and gay rights. Nonetheless, the rise of capitalist property and the Enlightenment profoundly undermined backward feudal social relations rooted in agriculture, which were largely swept away as West Europe and later North America developed into advanced industrial societies. The power of the church was constrained, while the status of women improved over time through social struggle. In the Near East and South Asia, however, capitalism arrived belatedly—and it arrived with European colonialism, which allied itself with the local feudal powers. Imperialist penetration blocked the path of social and economic development. Thus the religions of the East did not have to adapt in the same way as Christianity (or Judaism), and anti-woman barbarism has remained correspondingly more profound and overt. Karl Marx’s close collaborator Friedrich Engels explained the material roots of women’s oppression in his classic work The Origin of the Family, Private Property, and the State (1884). Under the “primitive communism” of the Stone Age, where a primitive equality prevailed, the division of labour between men and women derived from biology (women had to bear and nurse the young) and implied no subordinate social status. Technological advances, particularly the development of agriculture, created for the first time a social surplus. This was appropriated by a minority, producing the division of society into classes. To this day, the rulers of the imperialist world, joined by those in the capitalist neocolonies, reinforce all that is retrograde to shore up their rule. This is shown with crystal clarity in the case of Afghanistan. The U.S. and Canadian imperialists and their apologists have used the brutal oppression of Afghan women under the former Taliban regime as a justification for the neocolonial occupation of that country. But the anti-woman Islamic cutthroats came to power in Afghanistan in the early 1990s with the support of U.S. and Canadian imperialism, as well as that of the NDP [New Democratic Party] social democrats. And today’s U.S. puppet regime in Kabul continues and upholds the same hideous oppression of women. For over a decade starting in 1978-79, the CIA organized and armed the “holy warrior” mujahedin against the Soviet Union and its Afghan government allies. This was the first war in modern history in which the rights of women were a central issue. While the Soviet-backed government sought to institute progressive reforms like lowering the bride price to a nominal sum and providing education to women and girls, the CIA’s Afghan cutthroats were known for throwing acid in the faces of unveiled women and shooting schoolteachers who educated girls. When the Soviets sent troops into Afghanistan at the government’s urgent request in December 1979, we said “Hail Red Army!” and “Extend social gains of the October Revolution to the Afghan peoples!” Sending the army to clean out the reactionary insurgency opened a road to social liberation for the Afghan peoples. It underlined our Trotskyist understanding that the Soviet Union was a workers state, product of the October 1917 proletarian socialist revolution, despite its degeneration under a nationalist, Stalinist bureaucracy. The liberating effects of the Soviet intervention were measured in hard statistics. In 1988, women made up 40 percent of the doctors and 60 percent of the teachers at the University of Kabul; 440,000 female students were enrolled in educational institutions and 80,000 more in literacy programs. Western dress was common in the cities, and women enjoyed a real measure of freedom from the veil and subjugation for the first time in Afghan history. But rather than fighting to defeat the CIA’s Muslim insurgency, the Kremlin Stalinists under Mikhail Gorbachev criminally withdrew the Soviet troops in 1989. This was a huge betrayal of Afghan women, workers and leftists. It paved the way for the triumph of Washington’s woman-hating cutthroats, and for handing the Soviet Union itself over to counterrevolution two years later—a colossal defeat for the workers of the world. Beholden to their “own” capitalist rulers, throughout the 1980s the majority of Canadian left and feminist groups backed the anti-woman Islamic fanatics in Afghanistan against the Soviet Union and women’s rights. Two decades on, the feminists and reformist left have for the most part met the spate of “honour” killings within Canada with disgraceful silence. As for the reformist left, four years ago the International Socialists (I.S.) supported a campaign to give legal standing to Islamic sharia courts in Ontario. We opposed this as antithetical to the rights of women and the basic Marxist (indeed secular-democratic) principle of the separation of religion and state. Today the I.S., who are in an ongoing alliance with some of the most politically retrograde elements of the “Islamic community,” cannot bring themselves to utter a word about the murder of Aqsa Parvez. Such campaigns to pressure the racist, capitalist state to act on behalf of Muslim women falsely paint the Canadian ruling class—brutal oppressors of Native people, suppressors of Quebec’s democratic right to independence—as potential protectors, if not liberators, of oppressed women. Moreover, calls for the government to take a “firm stand” easily dovetail with reactionary demands for state-enforced bans on the hijab. This is the stance, for example, of the International Campaign Against Shari’a Court in Canada, whose founding activists are associated with the Worker-communist Party of Iran. Their online petition states that “wearing or carrying all religious symbols, such as Islamic hijab, in schools should be prohibited.” Banning the headscarf in the schools or other areas of public life would put wind in the sails of the anti-immigrant bigots, and would only deepen the isolation and oppression of Muslim women and girls. For Class Struggle Against Canadian Capitalism! The pervasive racism of Canadian capitalist society reinforces the reactionary hold of family and religion on immigrant women. And it’s not just a question of the unvarnished bigotry of right-wingers on radio talk shows and the outer fringes of the Tory party. The supposedly liberal program of multiculturalism serves to further the cultural and racial segregation of minority communities and the hold of “community leaders” with their ties to church, mosque or temple. For the Canadian capitalist ruling class, there is no contradiction between smearing Muslims as “terrorists” and simultaneously promoting reactionary elements among the Muslim clergy. Both reinforce the grip of capitalism—through scapegoating minorities on the one hand and regimenting them on the other. A central purpose of multiculturalism is to obscure the fact that immigrant and ethnic minority communities, like the rest of society, are class-divided. The struggles of immigrant and other minority workers for jobs, unions and equal status require breaking the grip of religious and other so-called “community leaders.” The fight for women’s rights is explosive precisely because it presents a frontal challenge to such leaders. Reactionary ideas take hold and grow in reactionary periods. Especially since the counterrevolutionary destruction of the Soviet Union in 1991-92, prepared by decades of Stalinist bureaucratic misrule, there has been a rise of fundamentalism of every kind: Protestant fundamentalism in North America (the abortion clinic bombers, the Bush government which sought to bury the scientific fact of evolution and teach “creationism” in public schools); Orthodox Jewish fundamentalism in Israel; an ever greater reach by the Catholic church into civil society in Europe; Islamic fundamentalism in the Muslim countries and in imperialist centers with large Muslim populations. All the variants of the “opium of the people,” as Marx called religion, are freely disseminated. The growth of this false consciousness is rooted in despair and the lie that class struggle and authentic communism are no longer possible. Our Marxist perspective for women’s liberation is rooted in the understanding that proletarian class struggle against capitalism is not only possible but desperately necessary. Far from simply being helpless victims of an oppressive, patriarchal system, hundreds of thousands of immigrant women workers in this country have real potential social power at the point of production, alongside their male and native-born co-workers. From the militant Hospital Employees Union strike in B.C. four years ago to the 2005 meatpackers strike in Brooks, Alberta, immigrant women workers have played a leading role in struggles against attacks by the ruling class and its governments. In the course of such struggles, the divisions and prejudices fostered by the capitalists to divide working people can be transcended. The liberation of women starts with the class struggle and will finally be achieved when the working class takes power, laying the basis to free women from age-old family servitude and reorganize society in the interest of all the oppressed. The family cannot simply be abolished; rather, its social functions like housework, child rearing, preparation of food, etc., must be replaced by social institutions under a workers state. This perspective requires a tremendous leap in social development, which can only be achieved through sweeping away capitalist rule on a global basis and replacing it with a rational, democratically planned economy. We Trotskyists fight to build a multiethnic vanguard party of the type built by the Bolshevik leaders Lenin and Trotsky to lead the world’s first socialist revolution in October 1917. Such a party will be forged through hard political struggle against the pro-capitalist NDP and labour bureaucracy, who work to tie the workers to their “own” national capitalists. Through its daily struggles against racism and women’s oppression, a revolutionary party will build the authority among the working class to mobilize it against all manner of social backwardness, including the vicious abuse of women. In a communist future, women will be fully and equally integrated into society, and anti-woman violence and bigotry, the reactionary constraints of family and religion and the repressive role of the capitalist state will be but barbaric memories of the past. For a Workers Party to Fight for a Workers Government! For Unconditional Military Defense! For Workers Political Revolution! Drop Charges Against Rebel Diaz Hip-Hop Artists!